There are a few different ways to access email campaign templates in your Mailchimp account. In this article, you'll learn how to access your templates from the Templates page as well as the Campaign Builder. To access your templates from the Templates page, follow these steps. Find the template you want to work with. Use the Sort by dropdown menu to view your templates alphabetically or by last edited. You can also search for the name of a specific template. Click the drop-down menu for your template and select an action. To access your templates from the Campaign Builder, follow these steps. On the Templates step, choose a type of template. To learn more about these options, read Types of Templates. Saved templates is only an option if there are templates saved to your account. If you want to use your own templates, code your own template inside Mailchimp or import your template code. Use our template language to create editable content regions and styles. 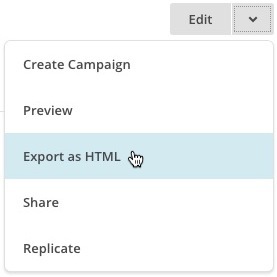 Any changes you make to a drag and drop template won't be reflected in existing draft campaigns created from that template, but changes to custom-coded templates will be reflected. If you want changes made to your drag and drop template to be reflected in your campaign, make changes to the template prior to adding your content. Learn how to use one of Mailchimp's predesigned templates as a starting point for your next campaign. Or get resources for coding your own template.